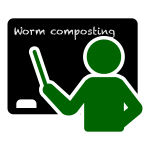 Some of us start vermicomposting to divert our household or farm waste away from the waste stream, and that is a benefit by itself. But what about the end product? If you’re reading this, you’re probably already aware that vermicompost, which includes the worm castings plus undigested organic matter plus a plethora of soil-enhancing goodies, is great for your soil. But can you succinctly explain why? Let me start out with a caveat, lest the internet lawyers accuse me of making false claims. Not all vermicomposts are created equal. Quality is a direct result of what the worms eat, what medium they live in, how the vermicompost is harvested and stored among other factors. So let’s assume we’re talking about high-quality vermicompost, K? See the list below for a quick list of the benefits of vermicompost. Studies suggest vermicompost does not kill pathogens in the soil, but rather keeps the pathogens from becoming virulent and attacking your plants. Vermicompost, in comparison to conventional compost, normally possesses higher levels of plant-available nutrients, particularly nitrogen and phosphorus. You will probably be surprised at how dense vermicompost is, thanks to its impressive water retention capabilities. In areas with depleted – or depleting – water sources and/or soil heavy in sand or clay, adding vermicompost or worm castings to the soil will help keep the water in the soil and conserve that precious resource. Vermicompost can be a thriving microbial community, full of beneficial fungi and bacteria that aid in soil health. Healthy soil is said to consist of around 5% organic material, but in over-farmed soil, that number has fallen to 1%. Introducing vermicompost to soil can help restore that balance. Similar to its effect on pathogens, vermicompost does not kill or repel pests, but can help stave off attack. Studies abound that show that vermicompost or worm castings application results in a higher yield with crops ranging from strawberries to tomatoes to peppers and more. Some vermicomposts can also feature hormones that regulate and promote plant growth. It’s far beyond the scope of this article (and my own knowledge) to explain how, but countless studies indicate earthworms and the microbes found in lively vermicompost are shown to remediate soil contaminated with hydrocarbons, agrichemical pollutants, heavy metal free radicals, and more. The best analogy I’ve heard regarding vermicompost vs fertilizer is as follows; fertilizer feeds the plant while vermicompost feeds the soil. And if you re-read the list above, most of these benefits are a result of how vermicompost benefits the growing medium itself rather than the plant directly. There’s no way to synthetically replicate the benefits of vermicompost. Scientists have not been able to replicate whatever it is in a worm’s gut that creates this magical substance, so it would be irresponsible to claim that all vermicomposts will possess the above characteristics. It is not a commodity like fertilizer. But any combination of pest/pathogen suppression, water retention, promotion of microbes, and plant growth PLUS diverting waste from the landfill HAS to be a good thing, no? Thanks and all the Very Best for a Peaceful Holiday Break. From:- Christchurch, New Zealand.